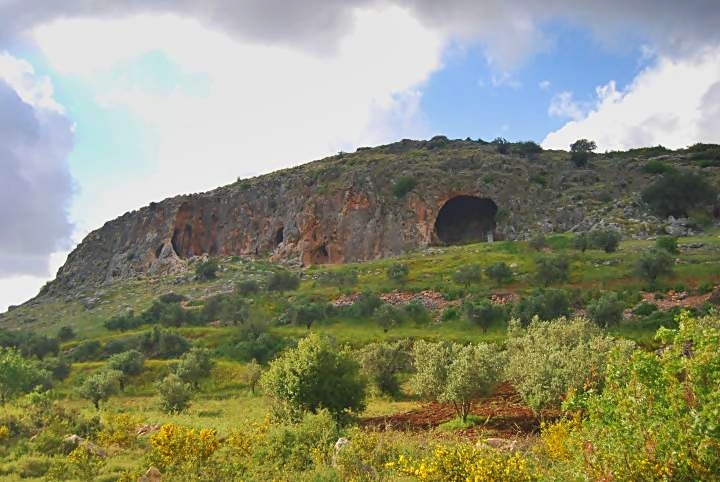 A nature reserve on the western edge of Beit-Hakerem valley, with a cluster of caves with remains from prehistoric settlements. The nature reserve is located on the south-western edge of the Beit-Hakerem valley. On its north side is a cluster of caves (called Pigeons caves) with remains of prehistoric dwellings. On the south side is Har Gamal, which is detailed in a separate web page. The aerial map below shows the site, in the center, from a north orientation. 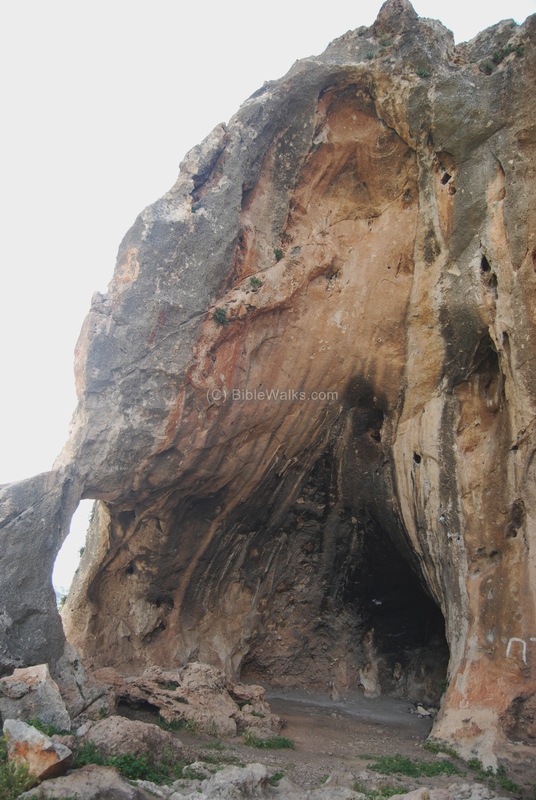 To get to the caves, turn left when arriving from Acre to the Gilon/Tzurit junction. There are two parking places - on the edge of the road just above the caves and on the north side of the road near the caves. Walk carefully down the path that descends down the cliff, following the white-red-white signs. You can point on the purple points to navigate to the selected point. The pigeons caves were the site of early man dwellings. It has three halls, and two others collapsed over time. The caves were used for dwellings and burial places for over 50,000 years. The following describes the prehistoric settlements in the area. The population in the Carmel and Galilee regions peaked during the upper Middle Paleolithic period (50,000-40,000 BC), the Epi-Paleolithic period (16,000 - 8,300 BC) and the Neolithic period (8,300 -4,500 BC). There were fewer numbers in the Early Paleolithic period (150,000-80,000BC) and the upper Paleolithic period (40,000 - 16,000 BC). 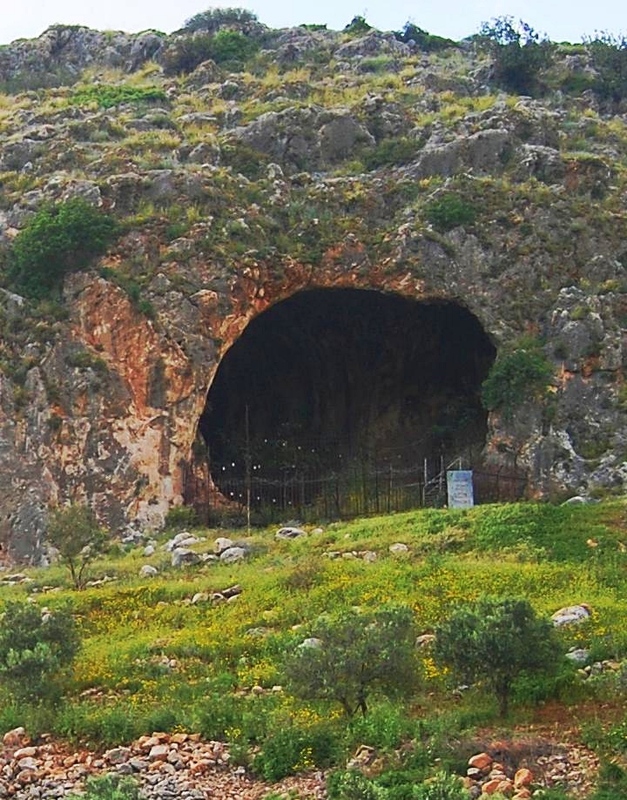 The other sites in the area were found near Kibbutz Evron and in the Carmel caves. In the Middle Paleolithic period (80,000-40,000 BC) were the majority of the settlements. These people knew how to make knives, scrapers and points out of flint. There were two types found: Homo Sapiens (our ancestors) and the Neanderthals ( the specie that eventually disappeared 1). Note that this time coincided with the last Ice age (100,000 to 10,000 BC), and so the climate was wet and cold. Check the Har Gamal web page for the periods from the Israelite period to modern days. The "Pigeons Caves" are located on the north side of the Yitzhar valley across from Har Gamal. They served as shelter for early man during the upper Middle Paleolithic period (50,000-40,000 BC) and during the Kebaran and Natufian periods (12,000-8,300) of the Epi-Paleolithic. Excavations from 1965 through 1975 unearthed habitation remains both inside the caves and outside on the terrace. The finds included numerous flint and bone tools along with burials of the former inhabitants. 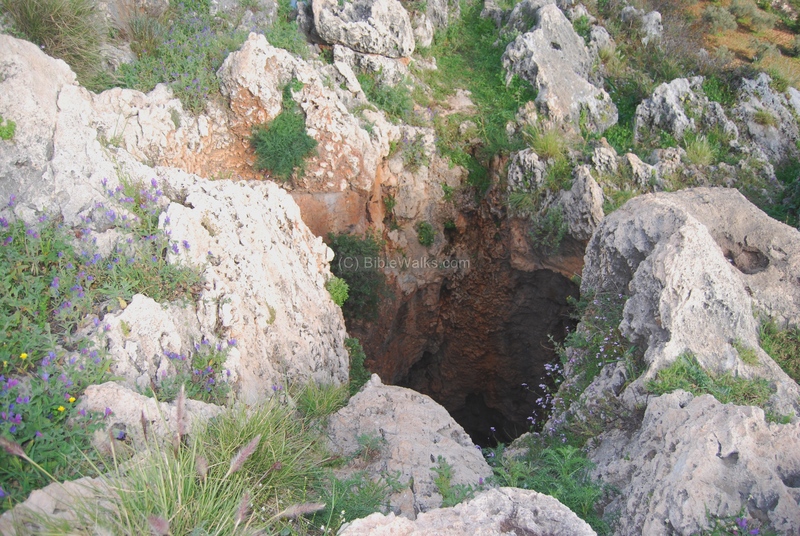 The eastern cave is sealed with a metal fence due to safety reasons. The markers used by the archaeologists are seen inside the cavity. The cave is swarming with bats, swallows, and pigeons, and consequently sounds like a noisy music box. The photo below shows a detail of the terrace in front of the cave. 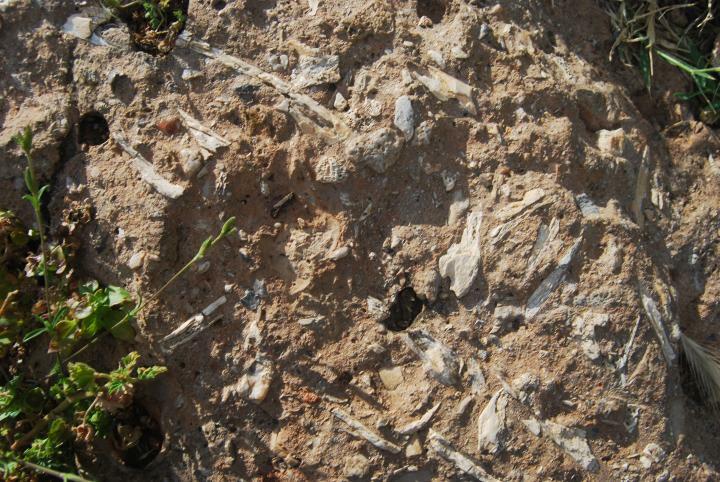 The surface here includes what appears to be a mixture of bones and other small objects. The photo below shows the entrance to the middle cave. As seen on the bottom left side, this is a favorite place for rappelling. The middle cave has a cluster of rooms. A view inside one of these rooms is seen below. The photo below is a view from another room inside of the cave, but looking up. There are rappelling ropes here too for an "inside job". 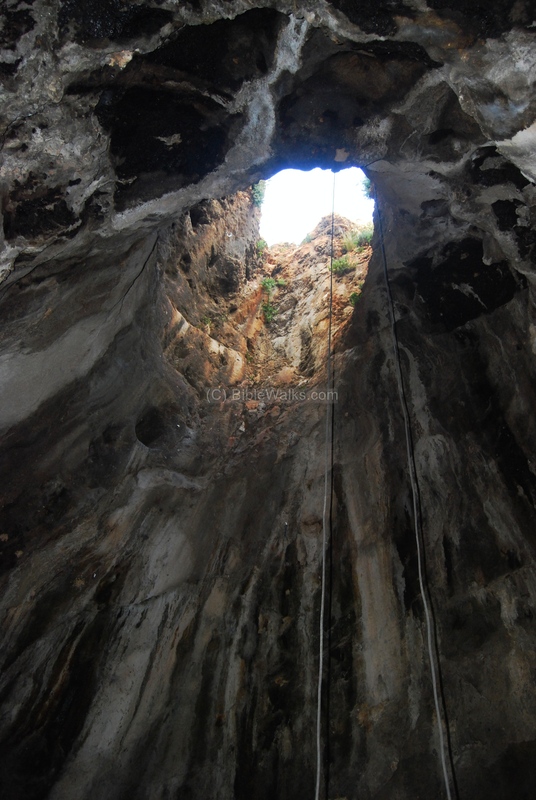 The photo below shows the vertical shaft that leads down into the cave. The western cave has partially "caved in" and only parts of it remained. 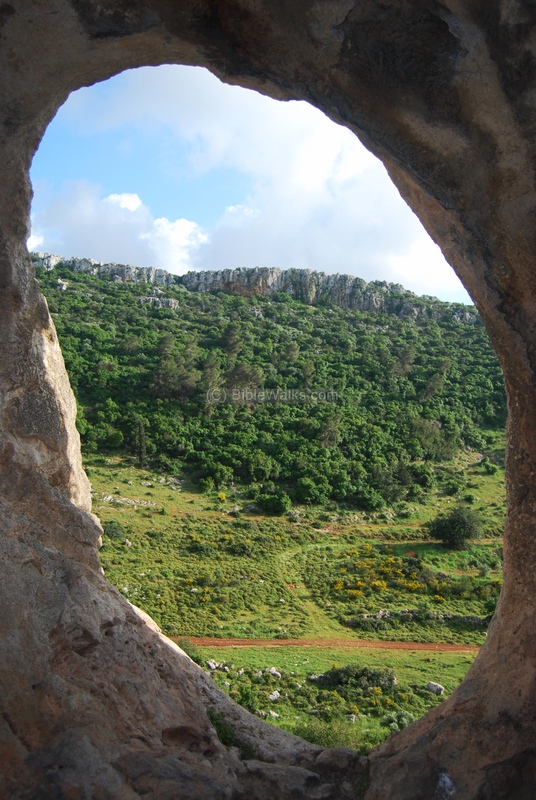 The photo below shows an interesting "key-hole" view from the cave towards Har Gamal. 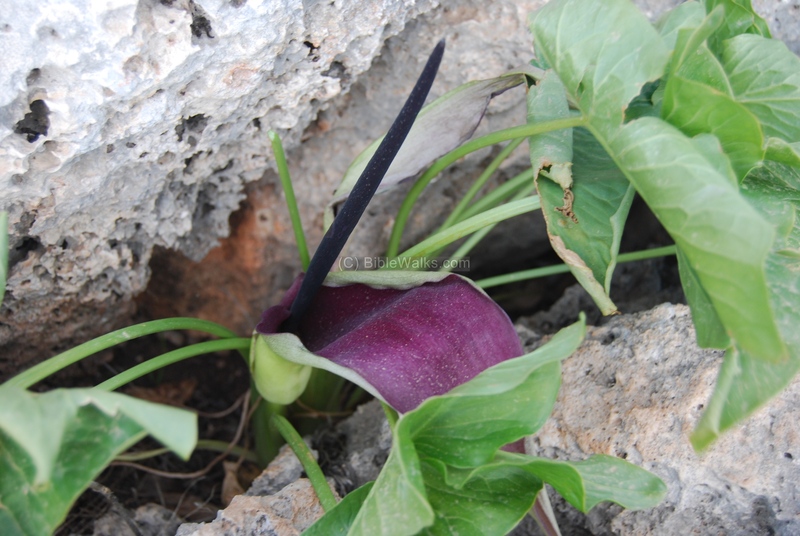 The photo below is the "Israeli Luf" (Arum Palaestinum, of the Araceaes) which flowers during months Feb-April. It is toxic (poisonous Aroin), although during the second temple period the farmers knew how to cook it safe (as written in the Mishna). 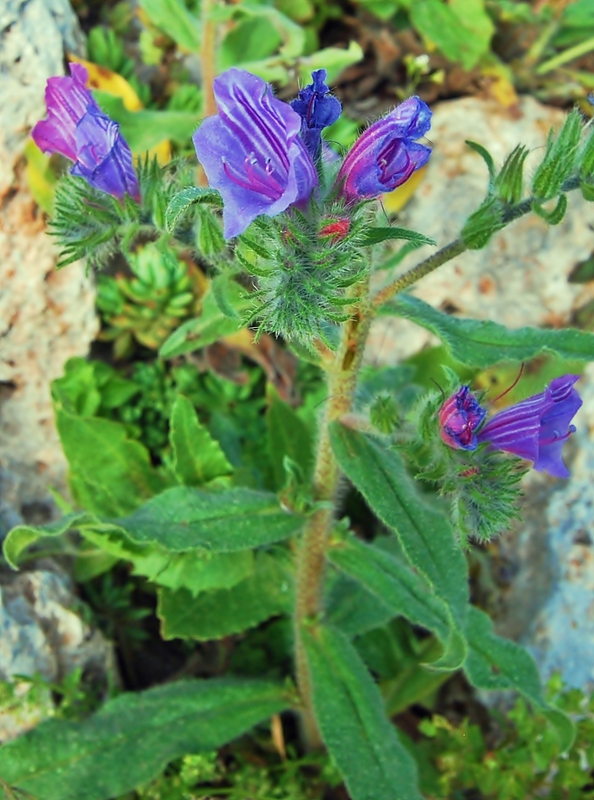 The flowers below blossom during spring and summer, and this shrub is known as Achna'i (in Hebrew) or: Hispid Viper's-bugloss (Echium Angustifolium). The flower changes color from pink to blue after a day or soon after it is cut. A new flower replaces the previous flower each day. "Looking for The Source" article by Jack Elliot, identifying Har-Gamal as the source of Michener's great novel, and Pigeons caves as source for the prehistoric section. 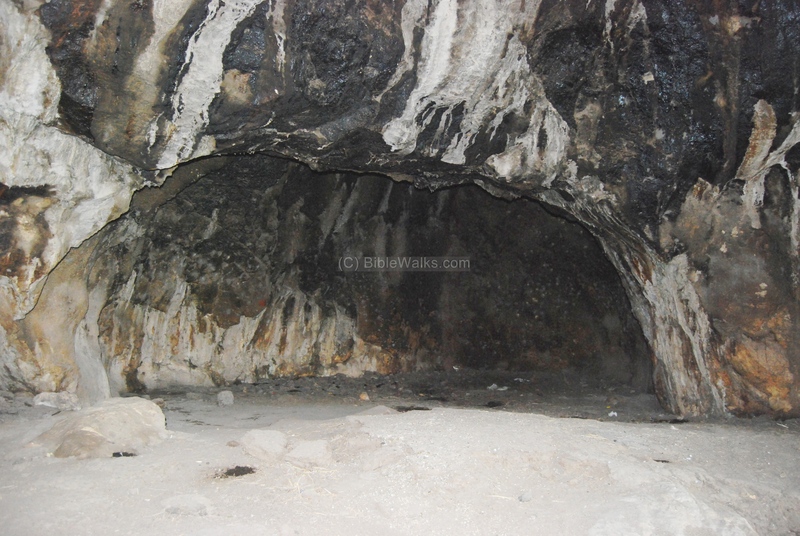 Ma'arat Yonim- Pigeons cave: Yonim - pigeons, Ma'ara - cave, Ma'arot - caves. 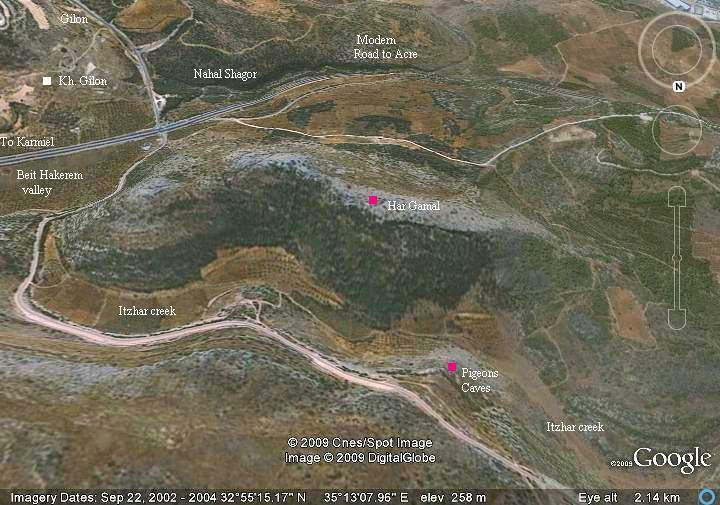 Yizhar creek (Itshar) - Hebrew for high quality olive oil; the name of the creek on the north side of Har-Gamal. Named after the olive oil production in the area. Its Arabic name is "Wadi El-Amik" - the deep valley. It is indeed deep between the mountains. Beit Kerem (BethCerem) - Hebrew: House of the vineyard (or grove).